Ground Manners matter. Riding is great but you handle your horse on the ground before and after every ride and probably many other times that you don't ride as well. So ground manners are important. See how to make your horse a pleasure on the ground. Auditors are $30 if preregistered by May 31st, $35 at the door. Please bring a lawn chair. To register: checks should be payable to Tracey Merrett and sent to Tracey Merrett, 3647 Checkered Tavern Road, Lockport NY 14094. For questions, call Tracey at 716 622-4869 or email Tracey at: traceymerrett@hotmail.com. To pay by Visa, MasterCard or Discover, call Kathy at (570) 458-6490. Please leave your name, phone number, number of the card and security code. Voice mail at Cedar Creek is secure for your convenience. Be sure to mention the date of the clinic you want to attend. Getting a good start to your ride - getting your horse to stand still at a mounting block. And some of those "mounting blocks" in the woods have roots! 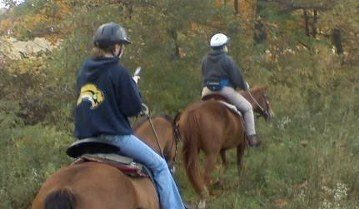 So we'll learn how to get the horse to move next to what you want to climb on and how to stand quietly till you get on. Trouble free worming - why get in a wrestling match with your horse (and sometimes he wins, right?) when he can learn to take worming graciously? College Level Leading - the key to a polite horse. If you are being run over or dragged around while trying to lead your horse, this will show how you can teach him to lead politely, WITHOUT pulling on you. Riders are $75 for non-Horse Council members, $65 for members if registered by May 25th. Limit 10 riders. Helmets required and please bring a lawn chair. Auditors are $25 for non-members, $20 for members. Please bring a lawn chair. A delicious lunch may be purchased on the grounds. To register: checks should be payable to WCNYSHC and sent to Barb Cunningham, 3021 Johnson Creek Rd, Middleport NY 14105. For questions, call Barb at 716-735-3529. 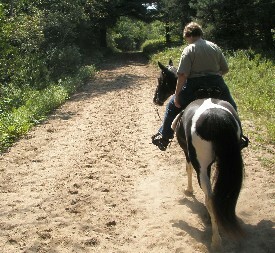 Wish you could instantly calm your horse on the trail? 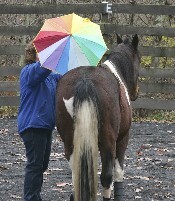 This one day Calm Down Clinic in NY will show you a very effective, gentle way to calm your spooking horse while riding. You already know "sitting relaxed" and petting your horse isn't always enough to calm him down. And you know he may do something you don't want if he's excited.